Maria Mitchell [pronounced "mə-RYE-ə"] (August 1, 1818 – June 28, 1889) was an American astronomer who, in 1847, by using a telescope, discovered a comet which as a result became known as "Miss Mitchell's Comet". She won a gold medal prize for her discovery which was presented to her by King Frederick VI of Denmark. On the medal was inscribed "Non Frustra Signorum Obitus Speculamur et Ortus" in Latin (taken from Georgics by Virgil (Book I, line 257) (English: "Not in vain do we watch the setting and rising of the stars"). Mitchell was the first American woman to work as a professional astronomer. Maria Mitchell was born in Nantucket, Massachusetts. She was the great-great-great-great granddaughter of Peter Foulger and Mary Morrill Foulger, and through them was a first cousin four times removed of Benjamin Franklin. She had nine brothers and sisters. Her parents, William Mitchell and Lydia Coleman Mitchell, were Quakers. Maria Mitchell was born into a community unusual for its time in regard to equality for women. Her parents, like other Quakers, valued education and insisted on giving her the same quality of education that boys received. One of the tenets of the Quaker religion was intellectual equality between the sexes. Additionally, Nantucket's importance as a whaling port meant that wives of sailors were left for months and sometimes years to manage affairs while their husbands were at sea, thus fostering an atmosphere of relative independence and equality for the women who called the island home. After attending Elizabeth Gardener's small school in her earliest childhood years, Maria attended the North Grammar school, where William Mitchell was the first principal. Two years following the founding of that school, when Maria was eleven, her father built his own school on Howard Street. There, she was a student and also a teaching assistant to her father. At home, Maria's father taught her astronomy using his personal telescope. At age twelve and a half, she aided her father in calculating the exact moment of an annular eclipse. Her father's school closed, and afterwards she attended Unitarian minister Cyrus Peirce's school for young ladies. Later she worked for Peirce as his teaching assistant before she opened her own school in 1835. She made the decision to allow non-white children to attend her school, a controversial move as the local public school was still segregated at the time. One year later, she was offered a job as the first librarian of the Nantucket Atheneum, where she worked for 20 years. 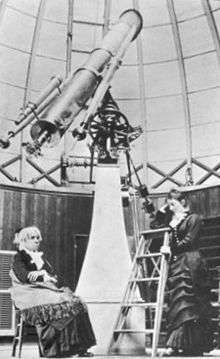 Maria Mitchell (seated) inside the dome of the Vassar College Observatory, with her student Mary Watson Whitney (standing), ca. 1877. Using a telescope, she discovered "Miss Mitchell's Comet" (Comet 1847 VI, modern designation is C/1847 T1) on October 1, 1847, at 10:30 PM. Some years previously, King Frederick VI of Denmark had established gold medal prizes to each discoverer of a "telescopic comet" (too faint to be seen with the naked eye). The prize was to be awarded to the "first discoverer" of each such comet (note that comets are often independently discovered by more than one person). Maria Mitchell won one of these prizes, and this gave her worldwide fame, since the only previous women to discover a comet were the astronomers Caroline Herschel and Maria Margarethe Kirch. There was a temporary question of priority because Francesco de Vico had independently discovered the same comet two days later, but had reported it to European authorities first; however, this was resolved in Mitchell's favor. The prize was awarded in 1848 by the new king Christian VIII. She became the first woman elected Fellow of the American Academy of Arts and Sciences in 1848 and of the American Association for the Advancement of Science in 1850. Mitchell was also one of the first women elected to the American Philosophical Society (1869, at the same meeting Mary Somerville and Elizabeth Cabot Agassiz were elected). She later worked at the U.S. Nautical Almanac Office, calculating tables of positions of Venus, and traveled in Europe with Nathaniel Hawthorne and his family. Mitchell never married, but remained close to her immediate family throughout her life. After she retired from Vassar College in 1888 she lived in Lynn, Massachusetts with her sister Kate and her family. There are very few of her personal documents from before 1846. The Mitchell Family believes she witnessed personal papers of fellow Nantucketers blown through the street by the Great Fire of 1846 and because there was a persistent fear of another fire she burned her own documents to keep them private. Mitchell died on June 28, 1889, at the age of 70, in Lynn, Massachusetts. She was buried in Lot 411, in Prospect Hill Cemetery, Nantucket. 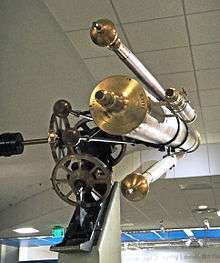 The Maria Mitchell Observatory in Nantucket is named in her honor. The Observatory is part of the Maria Mitchell Association in Nantucket, which aims to preserve the sciences on the island. It operates a Natural History Museum, Maria Mitchell's Home Museum, and the Science Library as well as the Observatory. She was also posthumously inducted into the US National Women's Hall of Fame. She was the namesake of a World War II Liberty ship, the SS Maria Mitchell. New York's Metro North commuter railroad (with its Hudson Line endpoint in Poughkeepsie near Vassar College) has a train named The Maria Mitchell Comet in her honor. On August 1, 2013, the search engine Google honored Maria Mitchell with a Google doodle showing her in cartoon form on top of a roof gazing through a telescope in search of comets. ↑ "P. Vergilius Maro, Georgics, Book 1, line 257". Perseus.tufts.edu. Retrieved 2013-08-01. ↑ Stephanie Sammartino McPherson. Rooftop Astronomer: A Story about Maria Mitchell. Books.google.com. Retrieved 2013-08-04. ↑ "Maria Mitchell (1818-1889)". National Women's History Museum. Retrieved November 1, 2012. 1 2 "Maria Mitchell Discovers a Comet". This Month in Physics History. American Physical Society. Retrieved November 1, 2012. ↑ Howe, Julia Ward. Reminiscences, 1819 – 1899, Houghton Mifflin Company, 1900. ↑ Lisa Norling (2000). Captain Ahab Had a Wife: New England Women and the Whalefishery, 1720-1870. UNC Press. p. 52. ISBN 0807848700. ↑ "Maria Mitchell". 5.uua.org. Retrieved 2013-08-04. 1 2 Renée L. Bergland (2008). Maria Mitchell and the Sexing of Science: An Astronomer Among the American Romantics. Beacon Press. p. 29. ISBN 0807021423. ↑ "Miss Maria Mitchell and the King of Denmark". The National Era (newspaper), March 22, 1849". News.google.com. Retrieved 2013-08-04. ↑ "Book of Members, 1780–2010: Chapter M" (PDF). American Academy of Arts and Sciences. Retrieved July 29, 2014. ↑ "Elizabeth Cabot Cary Agassiz, live and works". Women-philosophers.com. Retrieved 2013-08-04. ↑ "Maria Mitchell". Vassar Encyclopedia. Vassar College. Retrieved November 1, 2012. ↑ "Maria Mitchell Salary Dispute". Vassar Encyclopedia. Vassar College. Retrieved November 1, 2012. ↑ Beatrice Gormley (2004). Maria Mitchell: The Soul of an Astronomer. Eerdmans Young Readers. pp. 116–118. ISBN 0802852645. ↑ "Prospect Hill Cemetery, Nantucket, Massachusetts". Prospecthillcemetery.com. Retrieved 2013-08-04. ↑ "Maria Mitchell - Retirement and a Return to Lynn". Maria Mitchell Association. Retrieved 29 March 2012. ↑ Hoffleit, Dorrit (2001). "The Maria Mitchell Observatory--For Astronomical Research and Public Enlightenment" (pdf). The Journal of the American Association of Variable Star Observer. 30 (1): 62. Bibcode:2001JAVSO..30...62H. ↑ "Maria Mitchell's 195th Birthday". Google.com. Retrieved 2014-05-29. ↑ Khan, Amina (August 1, 2013). "Google doodle: Maria Mitchell, first pro female astronomer in U.S.". Los Angeles Times. Retrieved August 12, 2013. ↑ Barber, Elizabeth (August 1, 2013). "Google Doodle honors Maria Mitchell, first American female astronomer (+video)". The Christian Science Monitor. Retrieved August 12, 2013.